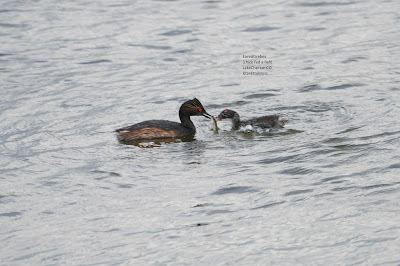 I photographed these Eared Grebes at Lake Cheraw in southeastern Colorado as both parents (they were up at the same time) were busy feeding fish and maybe lake vegetation to this very young chick. How do I know that the chick is less than 10 days old? Birds of North America online states, "Uncommon for chicks >20 d to receive parental care." I am not sure what that small fish is but it zebra striped. And according to the Birds of North America chicks receiving parental care by both parents are more likely to be less than 10 days old. While this chick mostly just waited for a parent to bring it food it occasionally would swim out to a parent to get fed as quickly as possible as shown in pic below. And I did see it dive once but it didn't look like it caught anything.